This unit is made in the USA. A great tool used to perform squats and deadlifts without the need for a power rack or squat stands. Easy way to teach newcomers how to lift without lifting heels off the floor. Helps to maintain a good center of gravity and body position to reduce risks of lower back injury. 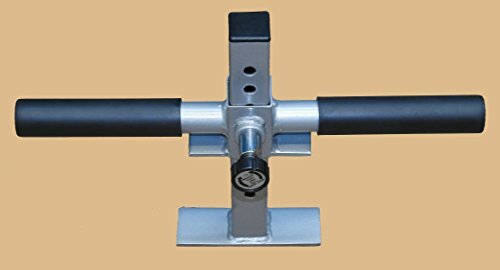 Uses Olympic Plates, 8 EZ Adjustable Handle Heights, Olympic Plates shown costs extra. Also Good for Front Deltoid Raises, Bent-Over Rows, Stiff-Leg Deadlifts, & selected Kettlebell Exercises.